Workers should not be disposable. 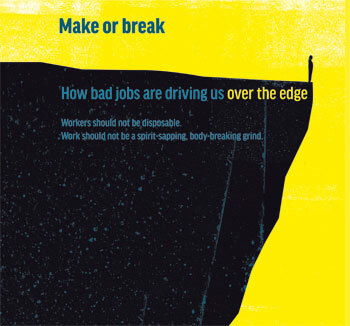 And work should not be a spirit-sapping, body-breaking grind. 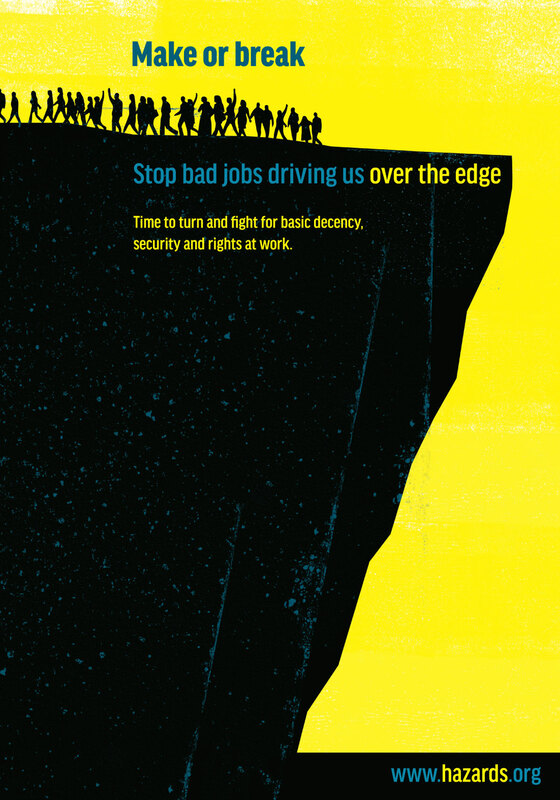 Hazards editor Rory O’Neill warns bad jobs are driving us over the edge and says it is time to turn and fight for basic decency, security and rights at work. The stories are complex, but the outcome can be depressingly predictable. 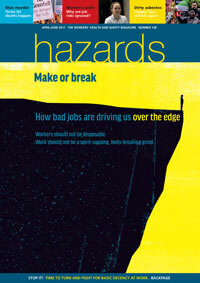 Jeffrey Taylor had been badly affected by a succession of safety issues at work, including an industrial fatality, demotion over a safety breach, a fear of losing his job and personal disputes in the workplace. A March 2017 inquest found the 55-year-old killed himself as a result of five contributing factors. He had also been affected by two family bereavements and a dispute over a will. One stand-out trigger was a 2007 incident at the Andrex toilet tissue maker Kimberly-Clark where he worked. Colleague Christopher Massey, 28, was killed by an unguarded toilet roll cutting machine. The global company was to blame; it was fined £180,000 in December 2011 for a criminal safety offence. In the months that followed the tragedy, Jeffrey Taylor was demoted for a health and safety breach and for six months was afraid he would lose his job. It was around this time he started taking the anti-depressant sertraline – the only substance found in his body when he hanged himself on 3 June 2016. 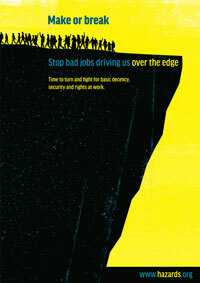 In March this year, the TUC warned the UK is turning a blind eye to work-related suicide. The union body was speaking out after a series of reports highlighting how work factors can put large sections of the workforce at a greatly increased risk (Hazards 137). A broad-range of contributors can be behind work-related suicides, including stress, harrowing or traumatic work experiences, oppressive management practices, job insecurity, overwork, toxic chemical exposures and occupational injuries, disability and diseases. Jeffrey Taylor ticked several on the list. But suicide is not the only ‘disease of distress’ linked to insecure, unsatisfying, unhealthy work. Substances misuse – prescription or non-prescription drugs and alcohol – is also a side-effect of bad jobs. And it is something the UK’s under-pressure workforce knows all about. NASUWT reported in April 2017 that 22 per cent of teachers surveyed admitted increased use of alcohol, 7 per cent said they have used or increased their reliance on prescription drugs, and 11 per cent their reliance on anti-depressants to help them cope with work pressure. Two per cent said it had caused them to self-harm. Nearly six in ten (59 per cent) said their job has adversely impacted on their mental health in the last 12 months. For many workers, workplace injuries and choking dust have been supplanted by the suffocating pressure of the modern workplace. And workers in the UK are faring worse than most. International trends in insecure work, a May 2017 report for the TUC, found the UK had the largest increase in self-employed workers in EU countries from 2008 to 2015, and the third largest increase in the number of temporary workers. The TUC predicts that if current trends continue, in five years’ time 3.5 million people in the UK will be in insecure work. It says the number is already approaching 3 million. Office for National Statistics (ONS) figures published in May 2017 revealed the number of people in the UK already relying on zero hours contracts for their main job surged by 13 per cent last year, to 905,000. Since then, evidence has accrued confirming insecurity is a top occupational hazard of the modern workplace. To the suicide and substance misuse, you can add the other consequences of job fear - higher rates of work injuries and ill-health, and a greater fear of taking sick leave or challenging mistreatment and poor safety practices. Whether you are delivering packages for Hermes or pizzas for Deliveroo, any hope of making a living is dependent on an unrelenting, unsafe and unsustainable work pace. Forget sick leave. 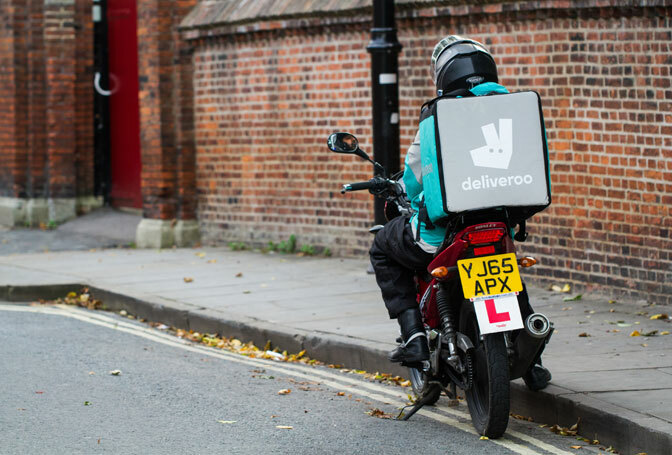 In March 2017, it was revealed ‘owner-drivers’ for delivery firms DPD and Parcelforce Worldwide face punitive charges of up to £250 if they failed to provide cover when they were ill.
‘Contingent work’, like zero hours contracts, is the most insecure of all. ‘Insecure employment’ covers a lot of sins – fear of losing your ostensibly ‘permanent’ job, inability to find permanent work, scratching a living from multiple jobs or working on short-hours or zero hour contracts, at the whim of someone who claims not to be your employer. They all have one thing in common – they are far more likely to damage your health than secure, permanent work. It is a cocktail that is, inevitably, depressing. A 2012 study of the impact of the ‘Great Recession’ published in the Journal of Occupational and Environmental Medicine, found perceived job insecurity was associated with a greatly increased likelihood of a worker reporting recent depression or an anxiety attack. TRIGGER POINT Since starting the Brexit process in March 2017, Theresa May’s deregulation-obsessed government has haemorrhaged support. Insecurity isn’t going unchallenged. US occupational medicine specialists, writing in the April 2017 edition of the Journal of Occupational and Environmental Medicine, called on the profession to “promote social justice” and challenge employment abuses in the ‘gig economy’. A 1 May 2017 report from the UK parliament’s Work and Pensions Committee called for an end to ‘bogus’ self-employment in the gig economy. And unions are attempting to do just that. A Unite campaign exposing employment abuses at Sports Direct, including a heavy reliance on agency workers with few rights, saw the company’s reputation damaged, its chief executive resign and its share price plunge. In September 2016, Sports Direct was forced to agree to an independent review. The union highlighted figures showing workers in the company’s retail, office and distribution section have 2.7 injuries per 100,000 hours worked – nearly twice the rate for the sector overall. Rates in the warehouse are higher still, at 6.6 per 100,000 hours. The Tories’ election shock may make it far more difficult for the government to stick to plans to further deregulate employment conditions, a top priority for many senior figures in the party when Theresa May triggered Brexit. Instead, a resurgent Labour’s 20-point plan to end the ‘rigged economy’ – including a ban on zero hours contracts, equal rights for all workers from day one, whether part-time, full-time, temporary or permanent, and guaranteed trade union rights – seems a much more tangible possibility. Molly Tran and Rosemary Sokas. The Gig Economy and Contingent Work: An Occupational Health Assessment, Journal of Occupational and Environmental Medicine, volume 59, issue 4, pages e63-e66, April 2017. Anne Case and Angus Deaton. 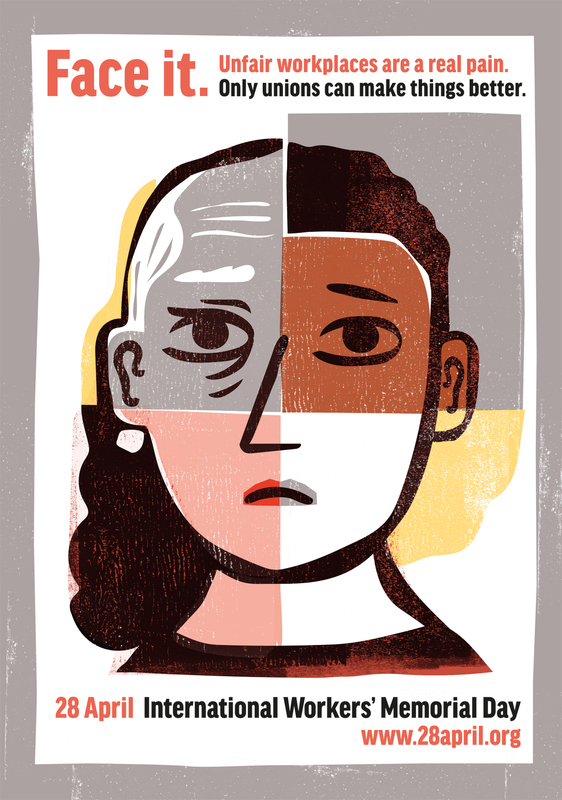 Rising morbidity and mortality in midlife among white non-Hispanic Americans in the 21st century, Proceedings of the National Academy of Science (PNAS), volume 112, number 49, December 2015. The Pump Handle. Self-reported work-related illness and workplace injury for permanent and temporary employees, HSE, 2015. Helen R Marucci-Wellman, Joanna L Willetts, Tin-Chi Lin, Melanye J Brennan, and Santosh K Verma. Work in Multiple Jobs and the Risk of Injury in the US Working Population, American Journal of Public Health, volume 104, number 1, pages 134-142, January 2014 [abstract]. Marianna Virtanen and others. Perceived job insecurity as a risk factor for incident coronary heart disease: systematic review and meta-analysis, British Medical Journal, volume 347, f4746, 2013, published online 8 August, 2013. Response to the article from BMA OMC chair Paul Nicholson. Sarah A Burgard and others. Perceived Job Insecurity and Health: The Michigan Recession and Recovery Study, Journal of Occupational and Environmental Medicine, volume 54, issue 9, pages 1101–1106, September 2012. House of Commons business, energy and industrial strategy committee’s Future world of work and rights of workers inquiry hearings. At the company’s mercy: Protecting contingent workers from unsafe working conditions, CPR, 2013. 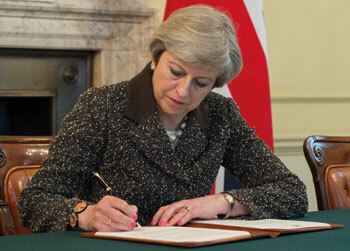 After her 8 June 2017 election humiliation, prime minister Theresa May announced out the blue that austerity is ‘on hold’. 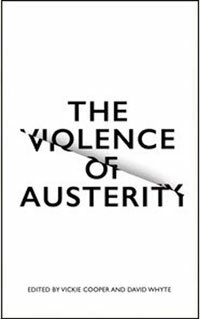 However Dave Whyte, co-author of a major new analysis, The Violence of Austerity, argues reversing austerity is a task that would need a major programme of reinvestment, perhaps on the scale undertaken by the 1945 Labour government. 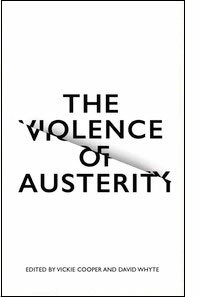 Our book, published in June – the same month that British voters rejected the cruelty of Tory austerity policies – brings together 31 leading authors to challenge austerity as an intensely violent attack on working conditions and on the poor. It provides a comprehensive guide to the social violence that has been unleashed by austerity and shows, unequivocally, how the cuts have been designed to punish already disenfranchised populations, in targeted and violent ways. The book begins by demonstrating that austerity is based upon a series of lies about economic recovery. It then exposes how successive Tory governments have unleashed a wholly unnecessary form of socio-economic experiment – a class war that makes the poor pay for the global financial crisis, often with their lives. In fact, the principle aim of austerity is to permanently dismantle the ‘protection state’: The social care system; the NHS; the welfare system; and the regulators that protect us from greedy bosses that risk our lives and greedy companies that damage our environment. A decade of cuts, when added up, means that some key agencies that protect us, such as the Health and Safety Executive and the Environment Agency, have been starved of resources and decimated. Scaling back on the already paltry funding in these critical areas of regulation will lead to a rise in pollution related illness and disease and will fail to ensure people are safe at work. The life-threatening cuts faced by all workers, by the unemployed, by the disabled and by the most marginalised sections of society are laid bare in this book. If nothing else, it sizes up very clearly the scale of the task that faces any future government – whether led by Jeremy Corbyn or anyone else – that aims to guarantee dignity and a decent quality of life for everyone.